Important: I NO LONGER SELL THIS PRODUCT. It’s an excellent fertilizer, but people weren’t buying it much. I’m keeping this page here for historical purposes. Conventional gardening uses too much N-P-K fertilizer. And it does so at the expense of dozens of other nutrients that are really important. Plus, the forms of nitrogen, phosphorus and potassium in N-P-K fertilizers are often harmful to the soil food web, especially triple superphosphate and potassium chloride. In the organic/biological farming movements, our focus is just as much on CALCIUM as it is on N-P-K fertilizer. That calcium focus started with the research of Dr. William Albrecht and Dr. Carey Reams and continues to this day among many organic soil consultants and ecological soil labs, as well as many of the incredible people who publish books through Acres U.S.A.
Of course all of the essential minerals are important – it’s just that calcium is very often the main one that’s deficient, and then phosphorus is next on the list. Sometimes you may have enough calcium and phosphorus on a strong acid or base saturation soil test (i.e. where you’re testing for the total amount of nutrients in the soil). But they’re often not available on a weak acid or Lamotte/Reams/Saturated Paste soil test (where you’re testing for how much of those nutrients are actually available to plants). I’ve seen a lot of soil tests over the years, and when you look at the weak acid part of the test to see which nutrients are the least available, it’s often calcium and phosphorus, and fairly regularly nitrogen, too. So we find it very useful to bring some in. We bring in dry mineral fertilizers to bring up the soil levels, and liquid fertilizers to bring up the availability. For the most part, the dry fertilizers are used based on a soil test, but when it comes to calcium and phosphorous, using just tiny amounts of the liquids is almost always a good idea. 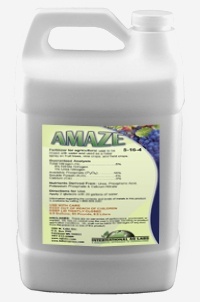 I mainly focus on broad spectrum organic fertilizers for my liquid foliar feeding. That means liquid seaweed, sea minerals and liquid fish. You can certainly create a healthy garden just using these products. But when I’m in a garden where highly nutrient-dense food is the main goal, sometimes I want a little more of the calcium, phosphorus and nitrogen. I don’t just want N-P-K alone – I very much prefer to include calcium in there. In fact, when I found this product, I was really looking for a liquid calcium and phosphorus product. The nitrogen was just a bonus. Calcium does a lot of things in the plant, but from a food perspective, two of the main end benefits are dramatically improved flavor and shelf life, i.e. increased nutrition and higher brix. Phosphorus also does a lot of things in a plant, but one thing that isn’t talked about very much in conventional gardening and farming texts is that the phosphate form of phosphorus moves all other minerals through the plant. In fact, both calcium and phosphate are important for making sure the plant gets all the other minerals. So if you don’t have enough of those two, your minerals aren’t able to get to where they’re needed. That’s why it’s nice to have some phosphate when we’re applying foliar fertilizers, especially with calcium because calcium is well known for not moving very far into a plant on its own. Liquid calcium is one of the more popular products in organic agriculture, and for good reason, but if you don’t apply it with phosphate, it’s not going to be nearly as effective. That’s why I spent so much time looking for a calcium and phosphate product. But a difficulty is that it’s tough to combine calcium and phosphate in the same solution because a reaction occurs that creates a kind of gel. With this product, they’ve managed to combine the calcium and phosphate (not phosphite or some other much less useful form) into one solution so that calcium can actually be used by the plant. Plus this product contains the nitrogen that’s often lacking, plus many trace minerals as well, so it really is a fairly complete solution. An acidic spray is helpful to temporarily soften the wax of the leaf surface in order for the solution to be able to move into the leaf. Including calcium in the mix will help ensure the rest of the nutrients can be properly utilized. Then, we want to have more negative charges in a spray than positive charges, which is where the phosphate and nitrate come in – they’re both negatively charged and so they pull the positively charged calcium and many other nutrients into the leaf. Last, once inside the leaf, calcium and certain other nutrients don’t move through the plant on their own, so the importance of that phosphate is to bind with that calcium and pull it through the plant. That’s what phosphate does. In organic gardening and farming the focus is on avoiding the use of all synthetic products. In biological gardening and farming the focus is on growing the most nutrient-dense food possible, using whichever products would help with that, as long as those products aren’t harming the environment. Now that’s not to say that there aren’t people in the organic group who are trying to grow nutrient-dense food. It’s just that the legal regulations around organic farming and gardening are usually about what you can’t use rather than what the outcome should be – nutritious, non-toxic food. Some have started using this word ‘biological’ to focus more on that outcome. They may use some synthetics to get the job done. It’s not as though they’re spraying 20-20-20 all over the place or something like that, but there are a few specialty synthetic fertilizers that are very helpful for plant health, and not harmful to soil and environmental health, and so have been deemed worthwhile using in small amounts. This product would fit into that group. The analysis is N-P-K of 5-16-4 – plus 5% calcium. Those seem like high numbers when compared to organic fertilizers, but we only use 3 Tbsp per 1000 square feet! Urea. Urea is the one ingredient I’ve traditionally not been a huge fan of because it’s often in the form of urea formaldehyde, and formaldehyde is not good for any living thing. But a tiny bit of just straight urea is actually a big help in a foliar feed. It has the nitrate form of nitrogen, and it also has carbon to balance it out. It’s probably about 1 of the 5% nitrogen content here. Phosphoric acid. I’ve been a fan of phosphoric acid for a long time, not for human consumption, but for use in the garden in small amounts. That’s one reason why I like using organic liquid fish fertilizer, because it often contains about 2% phosphoric acid. The reason there’s so much phosphate in this mix is because it’s what pulls many other nutrients into the leaf. Potassium phosphate. Potassium phosphate is another quality fertilizer. I think it’s main use here is to allow the phosphoric acid and calcium nitrate to coexist in the same formula. It supplies a bit of potassium, too, which is no doubt useful at this small of a dose. Calcium nitrate. Another excellent fertilizer – a great source of calcium and nitrogen. It’s probably about 4 of the 5% nitrogen content here. At the incredibly low application rates, I believe this product is one of the few synthetics that should be used in a garden where the goal is optimal health. I’m actually not going to spend much time convincing anyone to use it. I know some people have it in their head that all synthetic products are bad, and I can certainly understand that. It definitely won’t be one of my biggest sellers – but those who are growing food and decide to give it a try are going to be very happy. I mainly wanted to make it available to people who already know the benefits of getting just a small amount of N-P-K fertilizer with calcium directly into the plant. If that’s you, I imagine this product might become the foundation of your foliar program along with seaweed, fish and/or sea minerals. One last thing about the fact that this product isn’t organic. Just so you know, I don’t use Miracle Gro or 10-10-10 or almost any other synthetic fertilizer because they’re harmful to the environment and the soil food web, but this product does not fit with those other ones – this product is high quality all the way. Use just 3 Tbsp per 1000 square feet, at least monthly and as often as 4 times per month. No benefit to using any more than that per application. I use it every 2 weeks during my main growing months in the spring and early summer, about 8 times per year total. So for me 1/3 quart will do 1000 square feet for a year. Mix it with at least 50 times as much water, which is just over 1 Tbsp per quart of water, or a little more than 1/2 gallon of water for each 3 Tbsp of fertilizer. You also want to mix it with dextrose at 3 Tbsp per 1000 square feet in order to make the product much more effective. And if possible, mix it with liquid seaweed fertilizer for even more benefit. It’s also often combined with liquid fish. It shouldn’t be mixed with microbial inoculants, as it will be too acidic for them. It’s the acidity that helps it penetrate the leaf surface. What I like to do is come through the garden a day or two later with effective microorganisms or compost tea to inoculate the leaf surface with beneficial microbes. When you buy this n-p-k fertilizer with calcium, you get enrolled into my online Chemical Fertilizers course where I talk about the problems with using most chemicals, and the benefits of using just a small selection of them. The course includes 10 videos totaling about 60 minutes where I chat about those problems and benefits, calcium, phosphorus and nitrogen, micronutrients, how to choose them and how to use them. Includes calcium and phosphorus, undoubtedly the most important part of the fertilizer. Helps plants do everything better, because when plants have sufficient calcium and phosphorus, a whole host of other processes can happen properly. Is the only non-organic product I carry, just because I believe in it so much. As a free bonus when you order today, I’ll also enroll you in my online course on Chemical Fertilizers. Important: Be sure to pick up 2 pounds of dextrose for each quart of n-p-k fertilizer, which is really important for helping the fertilizer penetrate into the leaf. Hi Phil,Do you know where I could order or get this product in Canada? It’s not registered in Canada, so unfortunately not right now. Hi Phil,Glad to see you are knowledgeable about Albrect and Reams. I get my soil tests from International Ag labs and, my tests, from last year, showed a spike in P and K and Jon asked me about my compost use – actually it was horse manure and it was used as a mulch, not worked into the soil. That seems to have been enough to throw the soil off.Thus, my products from them this year are planned to correct this imbalance and get my calcium more available. I have to bring my amendments from MN – any thought of carrying some of their products on the east coast? Their tree kits were amazing. My two year dwarf fruit trees from Millers in Canandaigua in NY, were full size the next year and the peach tree was producing great peaches. I want to use some of their sprays and wish you would carry them so I could support your efforts in that area. I switched my EM to use yours and the mycorrhizae too. Good luck. Thanks Linda! Indeed this fertilizer is the basis of most of their sprays which are often a combination of things like dextrose, seaweed and fish – I like selling the ingredients separately so people have more control over what they apply each time. Where I live, we have so much evaporation of the 22 cms of moisture/year that our calcium is drawn up, not rinsed down, and we always need more magnesium. Any recommendations for a product like this, but with magnesium instead of calcuim? There are synthetic liquid magnesium products like magnesium nitrate, but I never see them recommended in the biological world that I keep track of. Foliar feeding with magnesium just doesn’t seem to be a common suggestion. For the soil, K Mag is a great product, and epsom salts can be useful, too. Hi Phil, are all your products certified organic? This npk fertilizer is the only synthetic product I carry. Everything else is organic, mostly certified organic, with a couple of exceptions. The seaweed meets organic standards, but isn’t OMRI Listed because they stabilize it with phosphoric acid, which is allowed for fish fertilizer, but not for seaweed for some reason. I actually like having the phosphorus in there. Dry fertilizers don’t tend to be certified organic, as they’re just mined rocks. Oh for pete’s sakes!!!!! 1/3 qt, 1/2 gal … all confusing my mind! Please just tell me how many Tablespoons of each of the following products for 1 gallon of water in a hose end sprayer: 1)seaweed plant food, 2) Bio Ag, 3) dextrose and 4) Amaze.And re-assure that I can put ALL of these together for one feeding one time a month?Thank you! You’re reply to Rans was very helpful in helping to simplify mixing instructions. However, I also have the Sea Minerals and the Inoculant. I understand that I should alternate use of the Sea Minerals & Fish Emulsion. My questions are should I also add dextrose when using the seaweed & Bio Ag? Also, my plants are already in, so is it still beneficial to use the inoculant & if so, how is it best applied? How many tsp. or Tblsp. per gallon? Yes, it’s a good idea to add dextrose or molasses when using the seaweed and bio ag.As for the inoculant, you can mix it with water and spray it onto the soil with a sprayer (or water your plants with a watering can). That’s still beneficial. The application rate is 1/2 pound of inoculant per thousand square feet. It doesn’t matter how much water you use in that case, just enough to get coverage. Yes, you can use the Amaze everywhere. And yes, compost is still king, especially for a very sandy soil. I prefer that manure be composted before applying it to the soil, if you can. Thank you Phil, I love your site and will be checking it frequently for advice!